KISTERS 3DViewStation VR Edition is extremely fast. When integrated with PLM systems, experience zero preparation time. The latest release of 3DViewStation VR Edition is a powerful and industrial application of virtual reality as VR hardware becomes a more affordable and viable option for companies of varying sizes. High investment costs such as power walls or caves are now a thing of the past. Immersive 3D model experience - 3DViewStation VR-Edition is the cost effective alternative to your Powerwall or Cave. The same high-end software features enjoyed by the entertainment and gaming sector are now available to manufacturing and product lifecycle management: photo-realistic rendering and interactive user experience. To achieve the level of performance frame-rate needed for impressive predefined environments, KISTERS specially optimized its virtual reality software. Industrial use of VR visualization focuses is on ever-changing 3D models that must be made available in ad-hoc VR applications. They must also accommodate various data formats without long preparation times. Far greater performance requirements than the gaming sector's VR software libraries, such as the well-known Unity engine, are being rapidly pushed to their limits. KISTERS 3DViewStation VR Edition is not based on a game engine. Instead it uses the same graphics core and CAD interfaces as the powerful 3DviewStation Desktop and 3DViewStation WebViewer versions. Users can quickly visualize even the largest CAD models in native data format within seconds - without any preparation time. 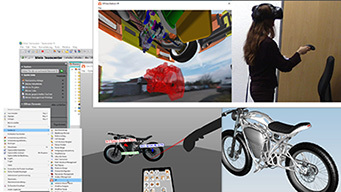 When integrated with a comprehensive API interface, the 3DViewStation VR session can be started directly from the PLM system.